As you've heard for a looong time . . . but it's true now, really . . . Bavarian Fire Drill, a new expansion for Illuminati, is going to press, and should be shipping in August. 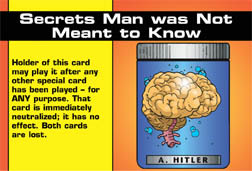 One of the Artifact cards is "Hitler's Brain," using the great illustration from INWO. Except we already used that illustration in Illuminati Y2K on a "Secrets Man Was Not Meant To Know" card. But Hitler's Brain is one of the archetypal artifacts of an Illuminated world. So it gets the art. But I hate to duplicate art. So . . . The first prize is $200, plus two copies of the new edition of Illuminati Y2K. There are no other prizes . . . but if you send us something we think is neat, we may make you an offer on it. Submissions do NOT become the property of SJ Games, except for the winner. If you do something cool and we don't pick it, it's yours. The only hint we are giving on the theme is the name of the card: Secrets Man Was Not Meant To Know. The style should be compatible with the existing Illuminati cards. You don't have to copy Dan Smith, but the card has to play on the table beside his work, and that of Shea Ryan and that Kovalic guy, and look like it fits. Format: 300 dpi CMYK TIF or layered PSD file. 2" x 2" square. How to enter: Send your file, zipped, to Will by the deadline date. Earlier is better. Later will be ignored. Let's see what evil you can come up with!